$249 Spring Special! Valid 05/01-05/10! Napili Gardens #8! Ideal for Families! Great Location! $249 Spring Special! Valid 05/01-05/10 05/21-05/25 & 06/10-06/15! We are nestled between Kapalua Resort and Naplii Bay, directly across the street from Napili Bay Beach. Our complex is small so you won't be surrounded by too many visitors. It's more of a small community atmosphere at the Napili Gardens. Our homes is a quality town home that features floor to ceiling windows in the front with a lush tropical garden setting in our backyard. It's ideal for those traveling with family and appreciate the extra space and a third bathroom! We have granite counter tops throughout the kitchen and bathrooms, stainless steel high end appliances, furnishings throughout the living room and each of the three bedrooms, along with a fully functioning bathroom, and lanai furniture. With a large family of our own we are well aware of the essential comforts of home that most families come to expect while traveling. You'll find a huge flat screen TV in the living room along with DVD/CD player. We've put a flat screen TV in the master bedroom as well. Central AC is outfitted throughout the house in addition to ceiling fans for added comfort. In the two car garage you'll also find the full-sized washer and dryer. Upstairs in the master bedroom you'll find a very comfortable king size bed and en suite full bath. The two additional guests bedrooms and full size bathroom is also located upstairs. Downstairs is the half bath just off of the dining room and the queen sleep sofa is in the living room to accommodate up to 8 people quite comfortably. We hope you enjoy our unit and take advantage of having your own private backyard complete with a high end gas barbecue grill. When you're headed for the beach simply walk across the street to Napili Bay Beach famous for it's superb snorkeling and swimming conditions. And if you don't feel like packing a lunch, just stroll to the end of the beach and dine at the Seahouse Restaurant...it's wonderful! Don't forget to take a stroll at sunset and just linger a little longer for the magnificent starlit night show! We look forward to your visiting our home and becoming part of our loyal ohana. We had a great family vacation. We were close to the beach and restaurants centrally located. Would recommend staying here. Thanks for the kind review, Margaret, and the recommendation. As you mentioned, this is a great condo for families. We appreciate you being our guest, and hope return again soon. Mahalo! Paradise for a big family! We had a wonderful time! We are a family of 6, and this place was beautiful and spacious! The location can't be beat- we walked less than two minutes to Napili Bay, our favorite spot on Maui. With little ones needing naps, and older kids needing space, this property fit everyone's needs! We loved the back porch, the garage, the kitchen, and having laundry facilities. We have stayed on Maui before, but this beat out any other place we have been. We will be back for sure! We're so glad you had such a wonderful time, John, and that our condo worked out so well for everyone in your family. Thank you so much for the kind review. We appreciate you being our guest and hope you do consider a return visit soon. Mahalo! The home was very clean and it had everything you could possibly need. The description said parking 2 cars in the garage would be tight but we had no issues. The A/C was a must for us and this home was perfect. we loved being able to walk 5 minutes across the street to Napili Bay. the location is a good 15-20 minutes north of Lahaina but if you're planning to spend your time in Napili / Kapalua, you have everything right around you (Kapalua is literally a minute north). Overall, we'd definitely stay here again! Thank you for your kind review, Kristin. We've tried to pick the best cleaning service on island with the goal that all our units should be as cleanly as you described. As you also noted, this an awesome location. You can get to multiple beaches, food, activities, and more very easily. We appreciate you being our guest, and hope you do return to the island again soon. Mahalo! Well located. Clean with plenty of towels. Lots of great beach stuff in the garage, including chairs! Had everything we needed. Great patio for bbq. Good at equipement. We had a blast. The non-master bedrooms did hear dog(s). Not a big issue for us. Bed mattresses could be upgraded. We would stay here again. Thanks for your kind review, Brett. We will take a look at the condition of the bed mattresses. As well, we will continue to monitor if any other guests hear dogs during their stay. We appreciate you being our guest and hope you do consider return again in the future. The property was top notch! The townhouse was beautiful, close to a great beach, in a quiet neighborhood and well stocked with all the essentials. We loved the back lanai ( beautiful wood deck and surrounded with lush tropical plants and trees). Loved not having to deal with any keys (always misplacing them). Close to all the restaurants and activities (but not too close). Thanks for your kind review, John. You touched on some of the things that really makes this property and condo unique. We appreciate you being our guest, and hope you do consider a return again soon. Mahalo! We had a great time while staying here. 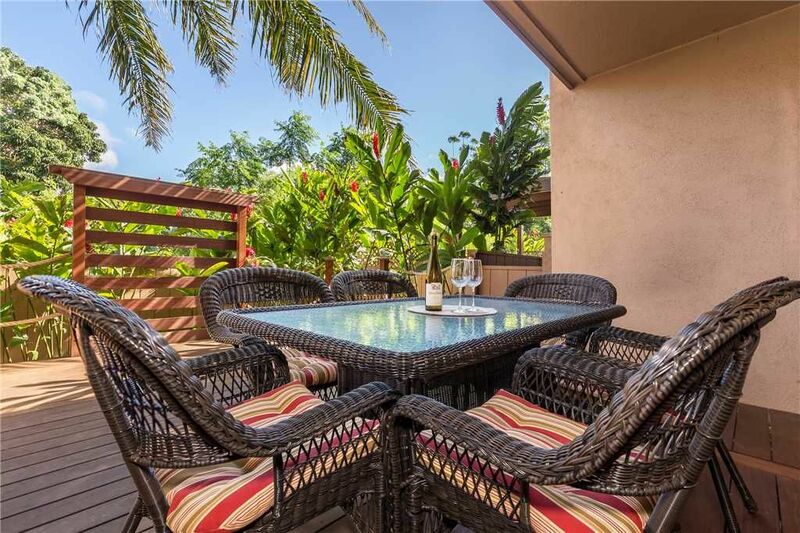 The location can't be beat with Napili beach right across the street, the Gazebo and Sea House restaurants within walking distance, parking for 2 cars, a great patio/lanai with BBQ, fully stocked kitchen and much more. My only minor complaint is that the AC wasnt the greatest but because it was January and the temps a little cooler, we just turned it off and opened the windows and sliding doors to the patio (there are screens to keep pests out) and had no issues! The condo was clean and had everything we needed! I look forward to staying here again on our next trip to Maui!! If a guest wants to return to our condo, we know we're doing something right. We're so glad you had such a good stay Mauircio, and thank you for the glowing review. After we we had Sturdevant out to the unit, they believe they were able to resolve the issues with the A/C. Our owner also followed up with them to make sure the issue was fully resolved. We appreciate you being our guest, and hope you return soon. Mahalo!